This article is 3270 days old. File photo of the power line destruction caused on Wednesday, May 5th. Photograph by Aric Aczel. Enwin Utilities and Windsor Fire & Rescue have had an extremely busy weekend so far. It’s basically a violent reprise from the bad weather last Wednesday. This time its worse. About every hour, for the past 24 hours, Enwin and fire fighters have been dispatched across the city to deal with downed power lines, burning power lines, and exploding transformers. The main culprit? Falling trees. 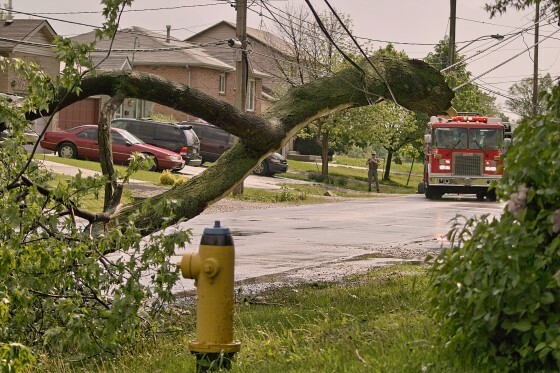 The latest report of downed wires occurred on Chilver Road, near Ottawa Street, at 1pm Saturday afternoon. A tree took down a power line in a residential yard. The wires were said to be sparking.